In Year 2 this year, our teachers are Mrs Ruddick, Mr Mortimer and Mrs Buckley. Also part of our team are Mrs Lake, Mrs Ling and Mrs Hoskins. Jackie, our reading mentor, will continue to work with children on Tuesday and Thursday mornings. Our aim in Year 2 is to support the children to become independent enquirers with the confidence to have a go, make mistakes, reflect and learn in a meaningful way. We enjoy lots of questioning and discussion between children, their peers and the adults in school. See below for details of the things we're learning in Year 2. Our Arts week was linked to India. During the week, lots of our staff members and children brought in interesting things to show us. Mrs Lake brought in her sitar, some children showed us a singing bowl from Darjeeling and mendhi patterns. We also had a great talk from one of our children and her Mum about Pakistan which is next to India. We learned a lot and enjoyed celebrating our cultural differences and similarities! During Arts week we were luckily enough to have a dance company come in and teach us some Indian dance. We also invited the children back to school one evening to enjoy some Indian food they had prepared during the day. They tucked into veggie curry, poppadoms, samosas and rice. We had so much fun! This term in DT, the children have explored different way to join materials to create moving parts. They had a team challenge where they had to make a dinosaur with moving parts using cardboard and a range of resources such as tape, paperclips, treasury tags and split pins. They had to work together to create a dinosaur, then we evaluated which worked best. From there we explored different types of moving parts, such as pivots and sliders and the children designed, planned and made their own Christmas cards with moving parts. We learned that some famous designers like James Dyson, made thousands of prototypes before having success. This week, the toy dinosaurs disappeared. We started to get letters from them and pictures of all the mayhem they were causing round the school. The children wrote letters to try and persuade them to return but so far, nothing's worked. Next week, they're going to design and label their own dino traps. In the meantime, keep your eyes peeled for them! In Science, the children have been learning about habitats and how animals have adapted to their surroundings. Today, the children worked collaboratively to create a habitat for an animal of their choice. As they worked, they explained why their animals were suited to the habitat. They thought about the features of animals, predators and prey, their diet and other factors such as the impact humans have on habitats. As part of Dino Day, we enjoyed a morning of activities such as making fossils, creating dinosaur skeletons, constructing dinosaur models and drawing ammonites. The children in Year 2 recently received a scroll from Lord Richard of Barnstaple because he had heard that they were learning about William the Conqueror, the Bayeux Tapestry and having Knight of the Year competition. He told the children that to be knights they needed to be brave, strong, good at PE, artistic and have a good sense of humour. He challenged them to write a letter each to persuade him that they could be knights, although he didn't think any would be suitable, particularly the girls. Well, what a shock Lord Richard had when he received the letters. Every child managed to persuade him that they were worthy of being knights. Nine children were given honourable mentions. There could only be one Knight of the Year for each class however, and the two children chosen were Kayla (Class 3) and Charlie (Class 6). Congratulations! As part of our topic on Kings and Queens, we've been learning about the links between William the Conqueror and Barnstaple (he ordered Barnstaple Castle to be build in 1068). We went on a history walk with local historian Tom and learned the story of the Bayeux Tapestry. The children chose their favourite part to write, painting pictures and then we embroidered the story too. See below for some of the work on this topic. To celebrate Chinese New Year, the Year 2 children came back to school for the evening. They enjoyed eating the spring rolls they'd made during the day, along with noodles, fortune cookies and jasmine tea. They also made lanterns and dragon masks. Earlier in the day, they learned about Chinese inventions and were amazed when we made a huge timeline along the playground and looked at how long ago the Terracotta warriors were built and the plough was invented! See below for some of their attempts to use chopsticks! We've been learning all about China and were interested in how their number system worked. Teen numbers are much easier to understand in China! After our maths lesson, the children practised water calligraphy on the playground. As part of our topic on China, we've been learning about the Great Wall of China and some of the famous bridges there. In DT, we had a challenge to build a free standing bridge that could span 20cm and hold a weight of 100g. The children had scrap paper, masking tape, lollipop sticks and paperclips. The children worked in teams to build bridges and then we tested them. The first time we tried, only 13% of the bridges held the weight. We learned about how strong and stable triangles are in construction and the children planned and built new improved bridges. This time 90% held the weight. Move over Brunel! We attended the Children's Remembrance service in Rock Park. Here are two of our children's whose Dads are in the forces, carrying the wreath to the memorial. Today we came to school dressed as heroes. Some children came as superheroes, others came as real life heroes, for example, soldiers and nurses. We learned about bats and their special powers of flight and echolocation. As part of our topic on Superheroes, we've been learning about some real life heroes. Here we are learning about the role of lifeguards and the Fire Service and how to stay safe at the beach and at home. In Geography, we are learning to locate and name the continents and oceans. The children have used a variety of websites, including Google Earth, and played puzzles and games (including a Twister style game) to practise finding them. The Year 2 children enjoyed a train trip to Exeter to visit the Royal Albert Memorial Museum and Exeter Cathedral. We wanted to visit the RAMM to learn more about our Polar topic. They explored and answered questions to learn about polar bears, penguins and Inuits. We were very excited to see the skeleton of Robert Falcon Scott's dog - the dog who had accompanied him on the Terra Nova to Antarctica! This week we enjoyed Polar Day - a day of learning all about the Poles. In science, the children were working scientifically to make predictions about what would happen to ice cubes in different places around the school. They learned about the freezing and boiling points of water and were able to reflect on their results to change their ideas. The children also learned about life in Antarctica for explorers and wrote a description of a polar setting. They enjoyed ice poles, dressing up and some fun penguin songs! The children, parents and staff all donated generously and we were able to fill 32 bags! A special mention goes to Millie, who donated a huge bag full of her soft toys, and Alfie, who donated a massive bag of Lego. Thank you all for your generosity! This week, we started learning the story of The Twits. The stinky characters turned up in class and we designed our own beards. We had a lesson of feeling and smelling various yucky foods and learned to generate synonyms to describe these things in different ways. Here are some pictures of our finished beards and the horrible things we felt and smelled! We celebrated the 100th anniversary of Roald Dahl's birthday with a dressing up day. The children dressed up as characters and we learned about the life of the famous author. We started with the question, "What was so special about Roald Dahl's nose?" and enjoyed excerpts from Boy and Going Solo (Dahl's autobiographies) to find out more. The children used historical sources such as photographs to order events in chronological order. We've sadly come to the end of another year at Pilton Infants'. To celebrate all the children's achievements we put on a show full on songs, dances and poems, looking back at all their favourite moments during their time at the school (see Chocolate Cake below). We were so proud of their performance, what an amazing group of children they are! We will really miss them and wish them all the best as they move on to their new school! 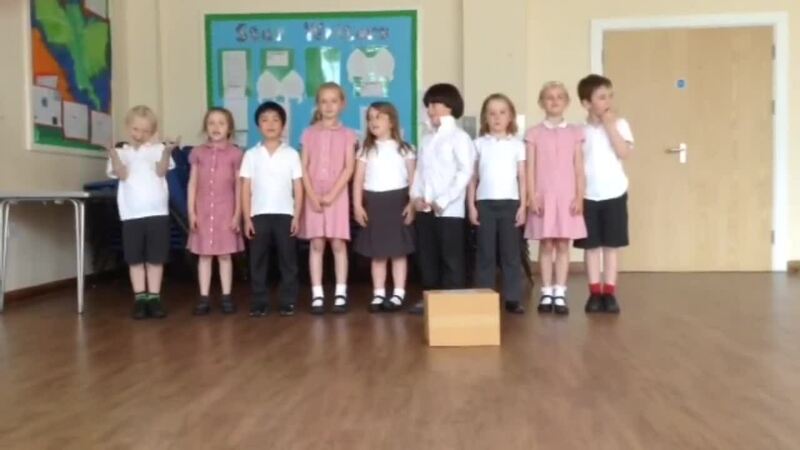 As part of our Year 2 Leavers show some of the children performed one of our favourite poems: Chocolate Cake by Michael Rosen. Here they are, after the shows had finished, a bit giddy because it was their last day at Pilton Infants'. We are sure it will make you smile! Science Week - health and well being. We had a visit from a microbiologist who taught us all about microbes. We looked at a sneeze in slow motion online and then we used green glitter as germs or microbes and saw how easily they spread and how difficult they were to wash off! We practised washing our hands properly! We looked at the effects of different drinks on teeth with an investigation using eggs and learned about healthy eating. Some of the children have been learning about the Naughty Bus by Jan Oke. As part of this, they visited Barnstaple Bus Station and caught the bus back to Pilton. Here they are buying their tickets and travelling back to school. Mrs Barrow comes into school to teach violin and piano. Today some of her students in Year 2 played to their class. We were really impressed to hear some lovely music and the children even performed extra tunes after shouts of 'encore' from their classmates. Congratulations on your first concert! Year 2 visited Dunster Castle as part of our topic. They had a tour of the castle, learned about the story of the Dunster dragon and tried hobby horse jousting! The children had to write letters before they went, to try and persuade the Luttrell family of Dunster to allow them to become knights for the day. They were very persuasive! The children and staff came to school dressed as characters from books. The children in class 6 worked together to create their own Oxford Reading Tree books for the competition celebrating 30 years of Biff, Chip and Kipper. In class 3, the children spent the morning performing drama pieces based on Maurice Sendak's Where the Wild Things Are. As part of our topic entitled "Are dragons real?" we have been investigating habitats and locating places around the world to compare and contrast places where people and animals live. Today we visited Exmoor Zoo where the children looked at the information about each animal and worked as a team to locate those places on their world map. We then used this to discuss why animals lived in those areas. We found lots of cold-blooded animals huddled under lamps while other animals from warmer countries (such as the cheetahs) didn't seem to mind the chilly Exmoor breeze! The children used the ipads to capture photos of the things we saw. Spring 2016 - This term our topic is Myths and Legends - Are Dragons Real? We couldn't take the children to space, so space came to Pilton Infants' today! What a week we've had in Year 2. "The glass bottle was no good because you can't squeeze it and push the air out." "I thought the bigger bottle might push the astronaut further because it has more air in it but the plastic was quite hard so we couldn't push it very hard." We had a visit from an astrophysicist from Exeter University who taught us all about the space suits that astronauts wear. The children carried out an investigation into modern nappies which NASA invented. They found that a teaspoon of granules in a nappy can fill a whole bowl of liquid filled jelly. "It felt cold and wet but when you stuck your finger in it, it came out dry!" NASA CRASH LANDING ON SCHOOL SITE! Did you hear a crash over the weekend? Well, we know what made the terrific booming noise - it was a piece of space junk hitting our school field! The army came today to take a piece away for testing but so far the children have worked out that it comes from NASA. Hamish has worked out that it must be from space "because you can see the bits where it burned when it came into our atmosphere." This week we had some little visitors in school, helping the Year 2s research pets for their non-fiction work. Meet William the tortoise and Snuffles and Smoothie the guinea pigs. Check out our really brave children who held a Corn Snake or Royal Python! As part of our work with SUSTRANS to promote active travel, we held an active travel breakfast on Thursday 16th July. All children that walked, cycled or scooted to school enjoyed a free healthy breakfast. As well as this, SUSTRANS also provided the school with two brand new scooter pods to help the children store their scooters. Fancy dress was encouraged, and we were very pleased to have Councillor Brian Greenslade attend. Well done to the large number of children and their parents who travelled actively! Did you see us in the North Devon Journal? Following a great campaign from our Year 2s against the landfill site (see planning notice below) we managed to persuade our MP not to back it. The site will no longer go ahead and the school field is finally safe! Here are some pictures of the children sharing their campaign with Mr Heaton-Jones on his visit to the school. I am a student from Pilton Infants and I have heard that there is going to be a landfill..." Sophie. "I look forward to talking to you on Friday. "It will stink the school out!" - Alannah. "Animals will get hurt or might die!" - Billy. "I'm going to talk to my Dad. He's a farmer and he might let the council build the landfill site on his farm instead." - Louis. A few weeks ago we reported that some of our Year 2's had entered the BBC's 500 words competition. Congratulations to Summer who made it through to the second round. We all enjoyed listening to your story at home time! This term we are learning about the environment. We've been enjoying our new Project X books all about the computer called Code which is trying to shrink everyone on Earth to save resources. We all became secret agents to try and defeat Code. We received a message to say Evil Lord Bite had kidnapped Mrs Sanders and unless she was found and freed there would be no school dinners for Year 2! the PE cupboard where we freed Mrs Sanders just in time. In the afternoon we made our own gadget watches like the Team X agents in the books. Can you spot any of Year 2 through their disguises? We enjoyed a visit to Arlington Court to learn how to create and follow a spy trail. We honed our team work skills when we worked together to make dens (some with fir carpets, slate floors and even a toilet!). In the afternoon, we put all this together to follow a spy trail, solve clues and save a fellow Agent who had been kidnapped by Evil Dr Worm! We ended having a very muddy play by the stream at the end of the afternoon and came back to school tired but very proud of ourselves! Bear Grylls eat your heart out! This year we ran a club for Year 2 children who wanted to enter the BBC 500 words competition. We had lots of children in the club who enjoyed sharing their writing. Here are the children that entered online (dressed up for Comic Relief). We look forward to sharing their work with the rest of the children and watching keenly for the competition results! Year 2 recently took a trip to Exeter, to visit the Build-a-Bear workshop. We wanted to have a go at making our own toys as we've been learning about toys in the past and found that families often made toys themselves. Here are some pictures of our day out and our photo-shoot when we got back to school! We had a visit from the man from Barnstaple Museum, who brought lots of old toys for us to explore. We learned about the different materials that were used in the past compared to now. Below are some pictures of the visit as well as some dolly peg toys we designed and made. We also learned to play old games such as marbles and hopscotch. "In the past children played together more. Now children play on their own. I like the old toys best." "In the olden days the children didn't have electricity so they had to make up their own games." As part of our topic this term on Explorers we asked the question "Why don't penguins freeze?" We had a penguin day where we learned songs, wrote Kennings poems and explored how humans and penguins keep warm. We've been watching March of the Penguins and have been amazed by how hardy these animals are. We decided to try being a penguin for the afternoon: huddle for warmth and look after our eggs. Here are some pictures! We read The Day the Crayons Quit by Drew Daywalt and illustrated by Oliver Jeffers. Then we learned about different ways of complaining and the types of language used. Here we are acting out some of the crayon's complaints! Those crayons were VERY grumpy! We had a team work challenge to try and complete puzzles with pictures of maps. Then we used them to learn the names of the continents and find out where we are in the world compared to the Antarctic. ...so we decided to make our own. The children worked in teams of three to create the sculptures. Their challenge was to improve their teamwork skills and their art skills. We contacted Su Blackwell who emailed back to say she was very impressed with the outcomes! During out Traditional tales topic we made gingerbread men but one escaped. We found these CCTV pictures of him but he never returned. If you see him please contact the school office.